Experience the fears of life as a parent in this Shelter package from Might and Delight. 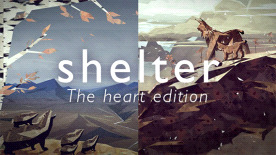 Featuring Shelter 1 and Shelter 2, traverse vast open spaces as you inhabit the life of a mother trying to protect her younglings from the dangers of nature. Food is to be found, but is there enough for everyone? You will learn that the cubs need food not just to survive, but to enable them overcome the varying challenges they will face as they make their way through the world. Are you ready for a truly different adventure, something that might evoke feelings you've never felt in a game before? In the wild, all living creatures are put to the test. The question in the end is who will survive to live another day?